Meditation, yoga, spiritual gurus, astrology and the Kama Sutra; things that come to mind when one thinks about India. There is no doubt that it is a country consumed by spiritual creed. 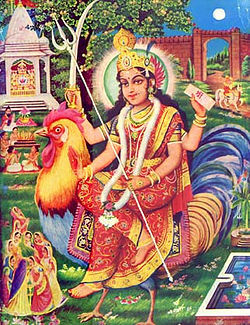 Bahuchara Mata is the Hindu goddess worshiped by hijras and is popularly believed that they are descendants of this deity. Bahuchara Mata, daughter of a known warrior of the charan caste, was traveling with a caravan along with her sisters. While on their travels, a notorious road bandit named Bapiya hijacked the traveling caravan. In charan culture, dying at the hands of an enemy is an absolute no-no. Instead, charans would rather take their own lives opposed to dying at the hands of someone else. However, Bahuchara decided that it wasn’t her, nor her sisters time to die. Instead, she cut off her and her sisters breasts as a way to curse Bapiya. What was he cursed with? Impotence! The only way for Bapiya to have the curse removed was if he paid homage to Bahuchara Mata by dressing and behaving like a woman. In India, women’s breasts is what defines a woman. Producing milk for children is viewed as having the power to sustain life. By cutting off the breasts, you are removing the essence of womanhood. This does not mean that women who’s breasts have been cutoff are automatically men, rather, they are seen as “neither male, nor female” just as the hijras. Superstition runs deep in Indian culture; never place new shoes on a surface like a table. If you sneeze before leaving your home, you must wait three minutes before walking out the door…OR ELSE! Walking down any of the heavily populated streets, on every block, you’ll see roadside temples of various Hindu deities for those who want to worship before heading to work, or for those who fear that they didn’t wait the recommended three minutes after sneezing on their way out. Talismans are worn by many underneath their clothing for added protection and unending devotion. I think you get the point. Yet, superstitious behavior is best seen when it comes to two things; marriage and the birth of a male child. These are the times where the hijras take to the floor and have their moment in the limelight. Being that they are seen as descendants of Bahuchara Mata, they are also seen as having the power to curse and to remove curses. Marriage in India is more than two people who are in love that want to share their lives together. It is a way of survival; a way to build strong family lineages. Hence the reason that the majority of Indians, whether Hindu, Muslim or Buddhist, still practice arranged marriages. People tend to marry within their caste, although there is a cultural evolution taking place where there are increasingly more people marrying for love and outside the caste they’ve been born into. Even then, superstition still seeps its’ way into the picture. Being that hijras are believed to hold the ability to curse and to protect from curses, they are often sought after for marriages and births. For a good price, hijras will come with their clan and will sing, dance and bless the newly married couple. In some cases, they aren’t necessarily invited at the wedding, rather they will just show up knowing that if they are turned away, that they will “curse” the couple’s marriage. In many cases, it’s a win, win for the hijras. Same goes for the birth of a male child. Being that India is a patriarchal society, keeping the males safe from harm (curses) is pivotal. If a child is born at home, hijras are allowed to aid in the birth and will begin the ceremony of protection then. If not at the birth, parties are thrown welcoming the male baby and the protection ceremony takes place. Again, singing, dancing and adorning the baby with talismans and flowers are all essential in protecting the health, stamina and power to procreate for the newborn male. However, there is yet another curse the hijras protect the baby from; becoming one of them, a hijra.